A shocking verdict pushes athletes to speak their piece. In February 2012, the stalking and murder of Trayvon Martin affected pro athletes—particularly African-American athletes—in a way that perhaps can be best described as intimate. Players like Carmelo Anthony saw the case far more clearly than George Zimmerman’s prosecutor: it was a racist murder and Trayvon, condemned to death for Living While Black, could have been them or their children. As Miami Heat star Dwyane Wade said at the time, “This situation hit home for me because last Christmas, all my oldest son wanted as a gift was hoodies. So when I heard about this a week ago, I thought of my sons. 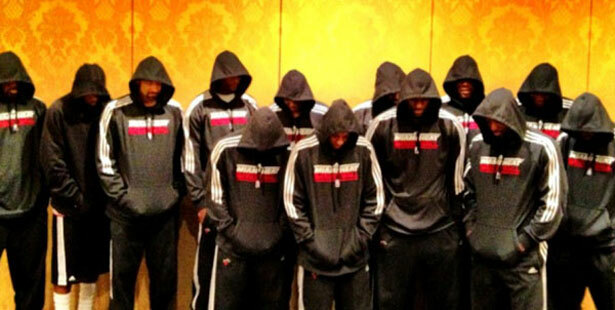 I’m speaking up because I feel it’s necessary that we get past the stereotype of young, black men and especially with our youth.” The entire Heat franchise, led by LeBron James, then famously posed with their hoodies up, in a photo that deserves to stand the test of time. Now, in the aftermath of the shock/gutpunch/depressingly expected verdict that set Trayvon’s killer, George Zimmerman, free and reunited with his gun, athletes are again speaking out. Before I report on what they have been saying, a quick word on why this matters. Millions of people—in particular, millions of young white men—follow these guys on Twitter. Many exist in their own bubble where either Trayvon Martin doesn’t register at all, or if he does, it's as someone who deserved to die. Maybe just maybe some of these comments by the people they cheer but rarely hear punctured their bubble. There were many others: some preaching calm, others disgust, others fury. But interestingly, even though there are a lot of right-wing athletes, I couldn’t find evidence of the horrific gloating seen in the darkest recesses of social media, not to mention Zimmerman’s defense attorney following the verdict. That speaks, in my mind, to the fact that even the most right-wing, white-survivalist, gun-loving player shares a more integrated existence in the locker room than many do in their daily lives. Once you see someone as a human being and not as an avatar of a predator, it’s damn hard to accept the word of this jury that they are disposable. Perhaps the final word should go to what has been the most tweeted athlete comment, at least in my circles. It was Oklahoma City Thunder center Kendrick Perkins who tweeted simply, “America justice system is a joke.” It is a joke. And if you know Kendrick Perkins, you know he’s not smiling. It’s marching time, people. No justice, no peace. Read Aura Bogado’s post on why George Zimmerman was acquitted.